We originally were going to check out of the Williamsburg Lodge early on Saturday morning, but one of the garden tours was scheduled for 9:30 that morning, and we had a bit of shopping to do, so we had already decided to cut Baltimore a bit short. The tour was great–worth staying for–although we were a bit surprised to learn how little the archaeologists actually knew about Williamsburg’s gardens back in the pre-revolutionary days. The gardens we see today are just approximations, showing the types of plants and the kinds of arrangements that would have been there. In a very few cases they do have some written records identifying certain plants in certain gardens, but that is all. Still, the tour was very interesting. After a nice breakfast at the Lodge and after the garden tour, we checked out and retrieved the Ford Escape. We then hit a couple of shops, picking up some items that we had noted earlier but hadn’t wanted to encumber ourselves with until we were ready to leave. We had the bulkier items shipped, but for the moment held on to the smaller items. We finally pulled out of Williamsburg around noon. Shortly after getting onto the interstate, we came upon a very strange sight: we passed an SUV towing a flaming U-Haul trailer. Yep, the trailer was completely on fire, with huge flames shooting out of the top and sides. The guy was getting off the freeway; I was slightly tempted to follow and see how things turned out, but with my luck the Escape would probably have caught on fire, too, or something. In any case, he pulled off to who knows what fate, and we went on. It happened too quickly to get a picture, unfortunately. After about an hour we stopped for gas. I’ve seen gas stations with mini-marts and fast-food restaurants, but where we pulled off was new to me: the gas station had a deli, a shop that sold guns and ammo, and a veterinarian. Go figure. We did end up getting food in the deli so we could keep moving; we were short-changing Baltimore enough as it was. As we approached Baltimore we decided we’d go straight to the airport to return the car, after which we’d take a taxi to our hotel. We dropped off the car with Hertz at around 4:00pm, and were heading towards the shuttle bus to the terminal (where we’d find a taxi) when the attendant called us back. He pointed to an SUV where another Hertz employee was standing and told us that that guy would take us. We thanked them both: we had a lot of luggage and shopping bags, and I wasn’t relishing the though of wrestling it all onto and then back off of the Hertz courtesy bus. After we loaded our baggage and hopped in the car, he asked us “where to?” We explained that we needed to get to the terminal so we could find a taxi to take us into town. He then asked where we were going in town, and we told him. To our astonishment, he said “I’ll take you. You can just pay me, instead of a taxi.” With that, he drove us all the way to our hotel in the Fell’s Point area of Baltimore. Needless to say, we were delighted; this saved us a great deal of time and trouble. 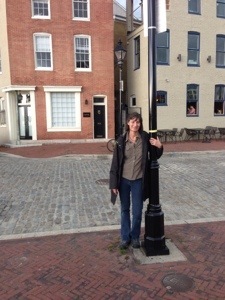 Our hotel, “The Inn at the Black Olive,” was in Fell’s Point, which is a trendy section of the Baltimore harbor. For those of you who are fans of the movie “Sleepless in Seattle,” Fell’s Point is where Meg Ryan’s character lived, and where she sat on the pier gazing out towards Seattle. We thought it would be fun to see those locations so we had picked a hotel nearby. We were both excited by the “green” and organic nature of the place. After we checked in we were given a tour of our room and were shown all of the “green” aspects of the place. Solar panels on the roof, radiant heating through the floors, bamboo, clay, and concrete; the place was LEED certified, and it showed. While we loved that, we were just blown away by our “room.” It was a suite, with a kitchenette, a dining table with seating for six, a living room with floor-to-ceiling windows, a small balcony with a table and chairs (we were on a corner of the fifth floor, and thus we had a great view), a nice-sized bedroom, and a huge bathroom with separate jacuzzi tub and a huge walk-in shower. And then the pièce de résistance: he pulled back a curtain to reveal a washer/dryer. We hadn’t been able to do laundry since Chicago so we were badly in need of a washing machine, and here one was! We quickly started a load before heading out on a walk. We did have a nice meal at the restaurant that night. We hadn’t made any advance dinner plans for Baltimore, but when we checked into the hotel we had the clerk check with the restaurant–which is on the top floor of the inn–and we were able to snag an 8:30 reservation. We went up at the appointed time, and although there was a table ready we were told that if we were willing to wait just a bit, we could get a better one. We were in no hurry at all, and the view over the harbor from the bar was nice, so we ordered a bottle of wine that we could later take with us to our table and sat at the bar. “A few minutes” turned into more like 30, but we were able to chat with the bartender and with the guy who had checked us in to the hotel and was now helping out in the restaurant. We were in no hurry, in any case, and our room was just one floor below. When we were finally seated we had a nice window table which was close to the bachelorette party. We did a lot of people watching that night, trying to figure out which woman was the bride-to-be and how others in the group might be connected (the bride’s mother was present and paying for the meal, and I think her grandmother was there as well; not what I would have expected at a bachelorette party). The women were a trifle boisterous, but we (and they) had a good time, and the food was great. All organic (including the alcohol), the menu had familiar dishes with a bit of Greek flair. Definitely recommended. Our train the next morning was due out at 9:30, so we got a good night’s sleep and were packed and downstairs by 8:00am or so to catch our taxi. 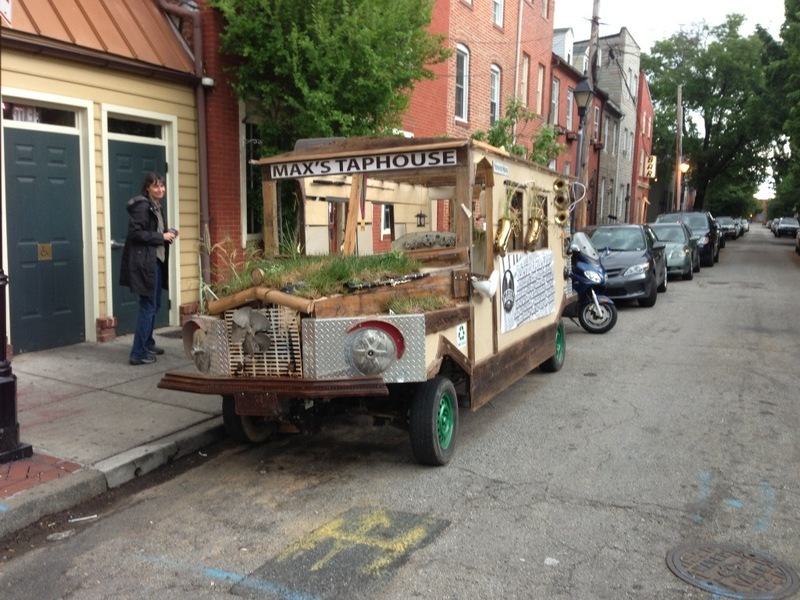 Our visit to Baltimore had been fun but was way too short. We had had almost no time to see anything other than one small part of the harbor. And we didn’t make it out to Fort McHenry, one of our mini-goals for this trip. 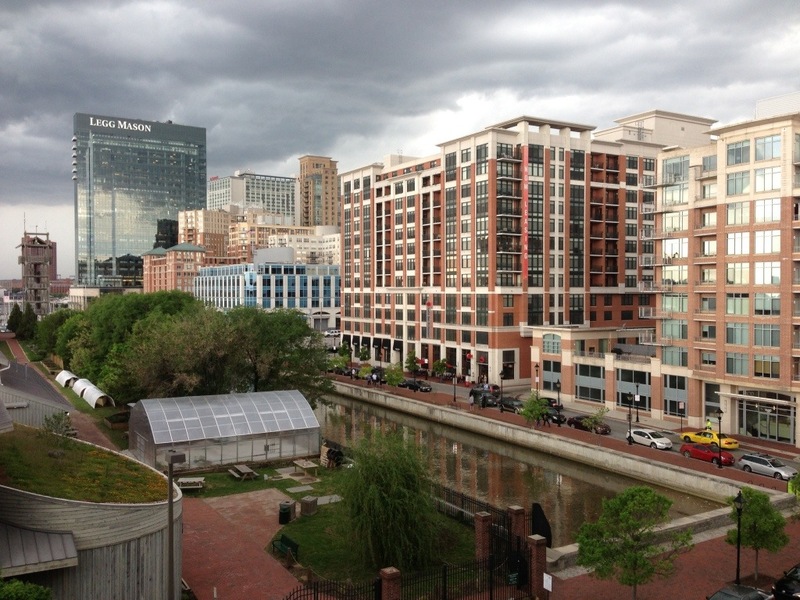 However, Nancy absolutely fell in love with Baltimore, to the point where she started wondering what a condo would cost (a lot, as it turns out!). So we’ll definitely be back, and on that future trip we’ll plan to spend multiple days in the area. Washington D.C. is very close to Baltimore, so I imagine we’ll spend time there on that trip, as well. And then we’ll probably go back to Williamsburg again, given its close proximity. It’ll probably be a year or so from now, but…does anyone want to join us? This entry was posted in An Amtrak Grand Tour on May 19, 2013 by Greg Wilson.